Why choose the Connemara? The Connemara is built to work. They are a compact, well balanced riding type with depth, substance and good heart room. They have fantastic temperaments, hardiness, staying power, intelligence and jumping ability and are suitable for children or adults. Sire: His Sire, Drummore Sea Breeze is a son of Castle Gizmo, 2016 Connemara Sire of the year at Horse of the Years Show, he is from the Performance lines of Moy Hazy Cove and grand prix showjumping pony Canal Misty Fionn, out of a mare by Windy Day who is a direct son of Killyreagh Kim. 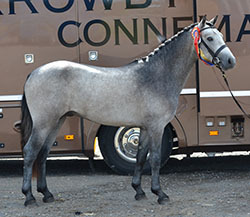 Moy Hazy Cove is the sire of the Killacloran, winner of the World Connemara Pony High Jump competition in 2012 and double winner at RDS 2010 and 2011. 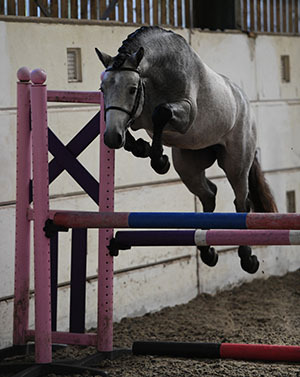 Canal Misty Fionn is the dam sire of Uttack Pondi a successful Grand Prix Eventer in France. Damsire: Woodbrook Cognac, a son of The Fugitive, who is a Clifden winner and a prolific producer of performance ponies in Ireland..
Lord d’Arcy was awarded a Higher First Premium (Eventing) as a 2 year old at the BEF Futurity in 2017 then licensed with the SPSS later that year, showing that his ability is unquestionable. Indeed, the SPSS grading judges considered him to be “a nice, very willing young colt” with good overall conformation, good ground cover in his free canter and his free trot, loose jumping, head & neck and frame & croup were all considered to be good. As he is only 3 in 2018, he will be backed during the summer, then turned away to mature. This exceptionally athletic young colt has a lot to offer the performance breeder, an incredibly versatile pony combining elastic ground covering movement throughout all gaits and a phenomenal honest jump. 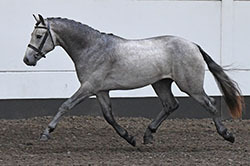 He has great limbs and heart room which are so important for the longevity of a sport pony. His temperament is fantastic and he has true potential as a sire of future children’s riding ponies. Born Buckskin, he carries one copy of the grey gene and one copy of the crème gene. Available no foal no fee in his first season at stud.